When using essential oils as part of your health care routine, there are certain issues that can only be addressed under the care of a certified aromatherapist, or other trained professional. People often ask me, “How can I find a local aromatherapist?” It can be hard to know where to start. Not all medical professionals are properly trained in aromatherapy- even those tend towards more natural based medicine. You might find it surprising that not all aromatherapists are created equal, either. When seeking the help of an aromatherapist, you’ll want to make sure that you’re placing your body in the hands of someone you can trust- just as you would any other health professional. Consider this: Doctor A studied his specialty extensively and will take your individual health into consideration before making a recommendation. Doctor B has some general knowledge of the field, but prescribes his treatment plan based on drug rep marketing. Which doctor would you chose as your physician? The example can be readily applied to the field of aromatherapy. While some professionals may have general knowledge and even certifications behind them, they rely heavily on outdated information and company marketing. More reputable professionals will care for the safety of their patients, rather than keeping up with the latest fad. The Alliance of International Aromatherapist holds high safety standards for any school or aromatherapists they endorse. 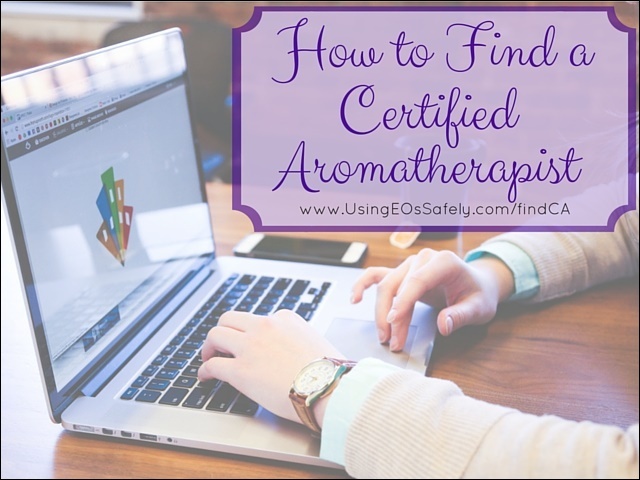 An easy way to find a reputable aromatherapist is to search their database. You can also find international listings here and here. If you can't find one in your area, Lea is now taking on private consultations here. There are many solid aromatherapists who are not registered with AIA. 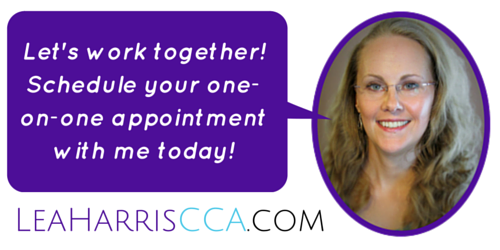 You’ll want to put any aromatherapist through your own interview process. Here is a list of things to look for when hiring an aromatherapist. What brand of essential oils do they use? Aromatherapists sometimes have their own line of essential oils, because their patient base allows them to buy in bulk. However, an aromatherapist or health profession that is a rep for an essential oil company raises a red flag as they may be relying on company marketing rather than an educational background. Do they properly dilute essential oils? Essential oils are powerful and highly concentrated substances that are rarely meant to be used without dilution. A good aromatherapist will know not only why it’s important to dilute essential oils, but how to properly dilute them as well. What do they say about ingestion? 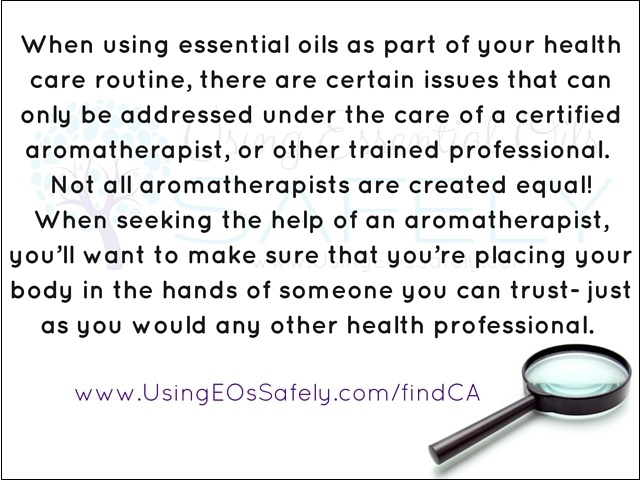 Essential oils should not be ingested unless under the care of a practitioner with the appropriate level of clinical training. You should use extreme caution with anyone who advertises internal use. If casual ingestion (such as in water) is recommended- RUN! Do they take into consideration age, health, and other personal factors? Every person is different, and should be treated as an individual. Children, pregnant women, and the elderly especially have unique considerations. They should understand the precautions for those on medication, those who may have bleeding disorders, those who have or are at high risk of cancer, those with breathing disorders, etc. How knowledgeable are they about the essential oils themselves? A reputable professional will understand shelf life, phototoxicity, and which essential oils should never be used or come with strong warnings. Do they play name games? 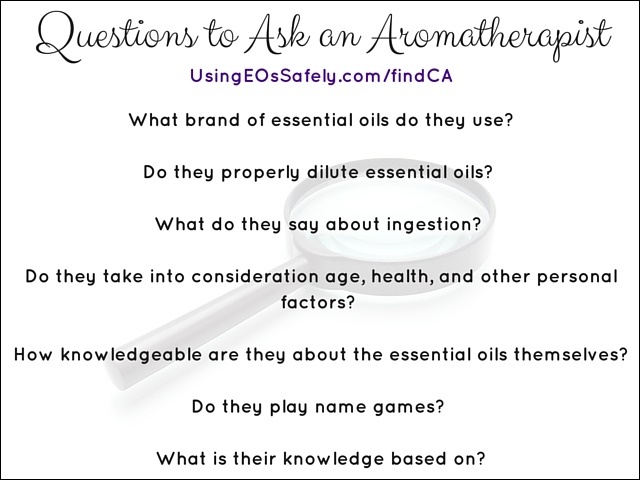 Caution should be used when professionals toss around terms like “theraputic grade.” A knowledgeable practitioner will know that all essential oils are by definition therapeutic, and that there are no “grades” of essential oils. What is their knowledge based on? A trustworthy aromatherapist will be well educated, and interested in the latest safety standards. Check into the school where they received their certification, and ask about their use of Essential Oil Safety. Remember, as a home aromatherapist, there is always room to learn more. You can start with a our free EO mini courses, or go all the way to become clinically certified yourself by enrolling in some of these educational courses! Knowledge is power, and the essential oil world can always use more people who are passionate about safety.